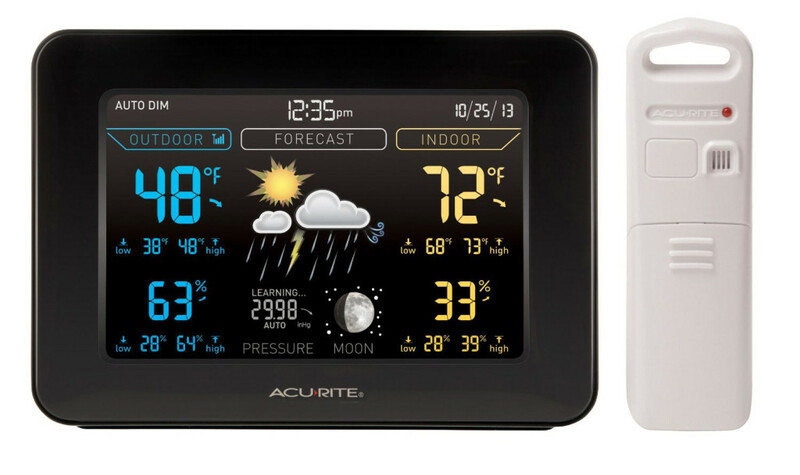 From weather stations to indoor-outdoor thermometers and sensors, AcuRite products are widely recognized for their quality and user friendly design. AcuRite offers variety of products available for wide range of niches; it doesn’t meter if you are an aviator, farmer, gardener or just a house owner looking for or more data from your local area, AcuRite has a good quality gadgets to get you covered. 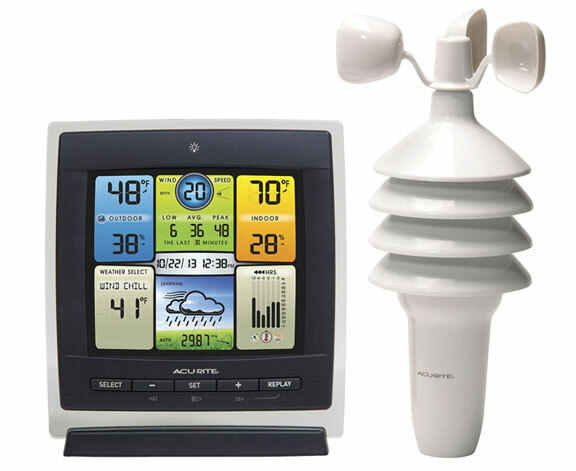 With this indoor outdoor weather station by AcuRite you have all the variables you will need from this type of device. The indoor unit can display humidity (in/out), temperature (in/out), moon phases, weather trend info with barometric pressure section, and convenient time and data display. AcuRite has self-calibrating weather forecaster that collects weather data from the compact sensor unit that sits outside of your hose. This sensor can gather specific sets of weather data points, like sudden changes in pressure, temperature and humidity to so that the build-in software can evaluate and display personalized local weather forecast. The color display has highly visible and easy to see digits (set into groups and color coded) with tree different lightning settings. The indoor unit comes with wall mount and the standart table top use. You will have no problem mounting the sensor because of thewireless data communication and range of operation of around 300 feet. You will need a 5 V power adapter (included) or 3 AA batteries (not included) for the display, and 3 AA batteries to power the wireless sensor. This is a good device that works very well and has accurate data readings. The product comes with one year limited warranty. With this High-precision 3-in-1 wireless weather sensor, Gardeners can plot their heart’s content – and weather geeks can have hours of fun.The professional digital weather station, priced at $120, includes a sensor that gets set up in the outside and monitor that sits inside and displays the current data, as well as trends. Among the information collected are: indoor/outdoor temperature and humidity, wind speed, heat index, wind chill and dew point, all from the unit outside, not form weather station miles away. There is also a programmable weather alarms to let you know about major weather changes or alerts, and a 12 to 24 hour forecast. Using self calibrating technology developed by AcuRite, the station uses the data to generate a short-term forecast for your specific location. The display monitor, with an LCD color display, can stand upright or mount to a wall. It also shows a chart of barometric pressure, temperature, humidity wind speed; a clock; the phases of moon; and daily high and low temperatures. The AcuRite 01500 has patented Self-Calibrating technology to provide you with personal local backyard forecast from 12 to 24 hour. The forecaster is using the 5 in 1 sensor package with – temperature, humidity, wind speed wind direction and rain fall to give you reliable local weather info. The device has some additional features such as bubble for easy mounting, solar panel, and removable debris screen to keep the rain gauge clean. 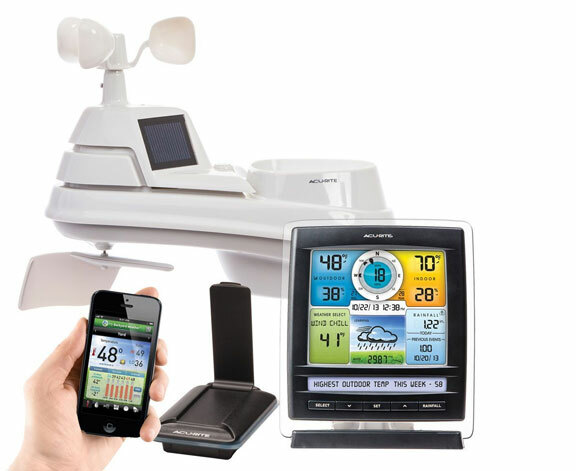 The display unit has everything weather enthusiast needs plus additional historical data. The digits on the display are big and easy to see, organized into sections for outputting the most recent weather info. Rain fall window with rain fall event – accurate reading for longer story events. This weather measuring tool is targeted toward weather enthusiast looking for professional home weather tracker on a reasonable price that gets the job done right. The 01500 has tech designed to give you accurate forecasts similar to weather channel updates. 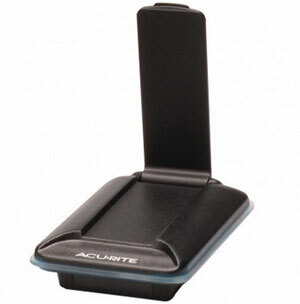 AcuRite 01500 is a good and quality product with reasonable price. The Weather Environment System purpose is to seamlessly connect to you and your weather and monitor weather conditions remotely for any location or multiple locations and customize automatic email and text alerts to know when conditions change. 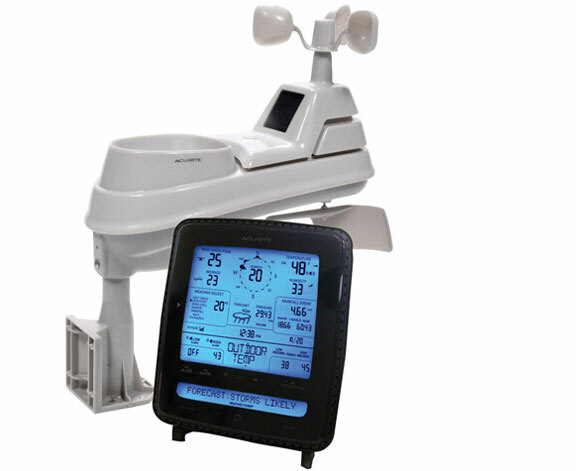 As with the previous 5-in-1 weather station the Weather Environment System comes with all the AcuRite Pro features like – temperature, humidity, wind speed wind direction and rain fall. In addition the Weather Environment System includes two interesting additional features. AcuRite Online and AcuLink App are design toward people in need of their weather data virtually anywhere. On www.myAcuRite.com you can check your data any time anywhere from wide range of devices like – laptops, tablets, mobile phones or desktop computers. You can view your sensor form Android or iOS mobile device after downloading the free app form App Store or Google Play Store. This model gives additional features like text and email alerts that will notify you when conditions change or your predefined points are reached. All the alerts are triggered by the available measured conditions – rainfall, wind speed, temperature or humidity. The second additional to this system is the AcuLink Bridge, whose purpose is to make all of the above possible. With Ethernet cable that plugs into your internet router, this device uploads all the data from the outdoor sensor to AcuRite App or myAcuRite.com website and can wirelessly synchronizes with up to 3 indoor and outdoor sensors.